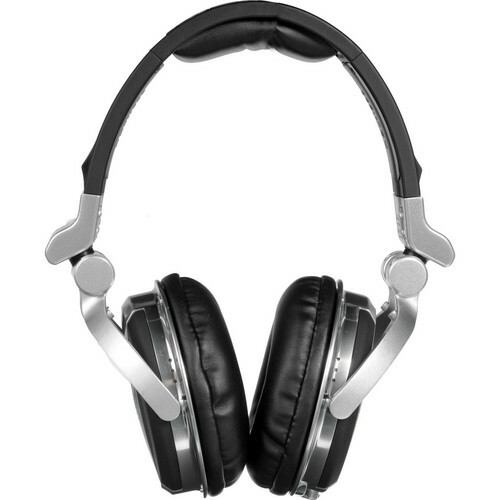 HDJ-1500 Professional DJ Headphones (Silver) is rated 4.2 out of 5 by 18. Rated 1 out of 5 by chrdha from HDJ 1500 S Headphones poor durability I must say that the HDJ 1500 S didn't deliver for me. The so called durable magnesium alloy parts at the base of the head band started to crack 6 weeks after I purchased the item resulting in the headphone falling into pieces.The headphone was sent back by the dealer to Pioneer itself that simply declared it could not be repaired.a bit hush for an item that is supposed to endure the rigors of frequent professional use and that is out or order, with no warranty, a couple of weeks after being bought. Rated 2 out of 5 by Honkamatics from weak, distorted, no bass The headphones were very disapointing. They easily distort, and have little bass. Cheap headphone cable connection, looks like its going to break eventually. Rated 4 out of 5 by gaterbait from Enjoying great sound I am a casual listener of music and enjoy rock as well as classical. The sound and comfort of the HDJ-1500's are great. The 50mm speaker driver units do a terrific job across the whole range of the music. Sound great with all my Apple products.They are a little larger than I anticipated, but the comfort has not been compromised and they are very good at sealing around my ears. I hear things on recordings I did not know were there. Rated 4 out of 5 by Gomes from Incredible Value I have been a DJ for only a little over 6 years, but this is my 8th pair of headphones. These are probably my favorite out of all. The build quality is outstanding and the price offered here is incredible. The sound is very clear and precise, keep in mind these are dj monitors; they will not make your music sound better than it is. The mid range is slightly overhyped but still acceptable. Rated 5 out of 5 by ANA MARIA M. from Great headphones! I'm a mobile DJ and I'm using Pioneer headphones only for my gigs. The reason is simple: very good sound, very comfortable fit. What I like about this model is the detachable cable(it locks in), the pads are very well made and they cover my ears very well(sound proof is key) and they sit flat into the bag provided making them easy to transport in my backpack. Rated 5 out of 5 by Dj ezy from I would buy this product again This product is at the top of the game. I am a Dj that travels alot and this product is very durable and handy. I also like that it comes with a carrying bag to avoid dust and scratches. Rated 5 out of 5 by Gio from Music flows directly into your brain I use the product 3 hours a day to listen to some music (house music). The quality of the sound is awesome, and is not distorted at high volume. Rated 4 out of 5 by Gamer from Excellent quality and sound The product handles great, and the sound is amazing. I can recommend this product to anybody who loves high-quality items.